Are you a certified GERALD ANDERSON lover? 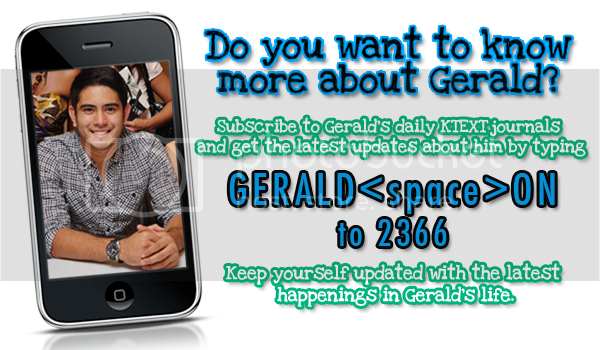 Do you want to be a part of the growing GERALDNATICX family? Do you wish to get closer to Gerald and to other Gerald lovers? Do you want to join the group's activites such as parties, set visit, mall shows, premiere nights, etc.? If YES, simply click the link and fill up the APPLICATION FORM. The story of Budoy is about a well-renowned family of doctors, the Maniegos. Bound to success but with no child, Dr. Anton Maniego (Tirso Cruz III) performed an artificial insemination to his wife Luisa (Zsa Zsa Padilla). She give birth to their child "Budoy" (Gerald Anderson). Budoy's birth is a family blessing but later on turns into the family in shame when they discover that Budoy is suffering from Angelman syndrome, which delays his intellectual development. Predicaments arises against Luisa, who became very protective of Budoy and the rest of Maniego family. Until Budoy's fifth birthday that he gone missing and be found by Elena (Janice de Belen), the Maniego's former caretaker. Meanwhile the family decides to hide their dishonor with their abnormal son Budoy and replace him with a normal child named Benjamin (Enrique Gil). Growing up not knowing their past, Budoy and Benjamin became rivals at school and to the girl (Jessy Mendiola) whom they are both seeing. Won't Last A Day Without You revolves around the story of DJ Heidee (Sarah Geronimo), who gives love advices to radio listeners. A heartbroken and "bitter" woman, her advices mostly prompts problematic couples to break up. Her bitterness in love roots from the unhappy ending of her 5-year relationship with her ex-boyfriend. Thus, she develops into being a man-hater. But when Andrew (Gerald Anderson), came into her life, she eventually learns to forgive men and fall in love, once again. Gerald Anderson is now on INSTAGRAM! His account name is [highlight]andersongeraldjr[/highlight]. 24/7 IN LOVE, in cinemas on November 21, 2012. Catch Gerald Anderson at the Mint Meet & Greet in SM Fairview on November 16, 2012, 5pm. Simply buy any Mint product of any amount and present the receipt upon entry to the event. 1 receipt is to 1 entry. Keep posting and show some love and support to our dearest Gerald.